Gaggy is incredibly agile and has a huge amount of acrobatic prowess. As well he has shown himself to be a formidable fighter. Scream: Gaggy's most powerful ability is his ear shattering sonic scream. His scream is powerful enough to destroy a funhouse house of mirrors, due to its high pitched frequency. Weapons: Gaggy carries an assortment of deadly joke gags and Joker toxin around with him. Gaggy Gagsworthy was once a member of the circus before joining the Joker in a life of crime. As part of the circus, Gaggy was a tightrope walker until the circus hired a new act, The Flying Graysons. Gaggy was then sent to be a clown and part of a freakshow, which he resented. During an act in which Gaggy lashed out on one of his fellow clowns, he caught the attention of the Joker. 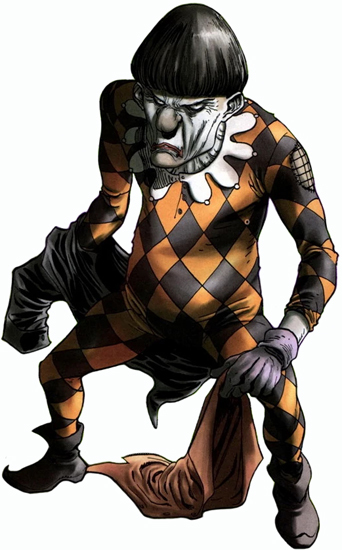 Willing to kill anyone for laughs, Gaggy teamed up with the Joker, becoming Joker's answer to Robin. Together they committed many crimes using gags and props.